The LODGE STRESSMETER is a slit-die rheometer that measures elasticity and viscosity for liquids in steady shear flow in on-line and sample modes. Higher shear rates and shear stresses can be obtained than any accessible with other rheometers. It could give improved quality control on polymer synthesis and in other industrial processes. The instrument is manufactured and marketed by Chemical ElectroPhysics, Inc.
An International Union of Pure and Applied Chemistry Working Party showed that two low-density polyethylene resins with significantly different film-blowing properties gave the same values for the dynamic modulus G¢ (a linear elastic property) but measurably different values for the first normal stress difference N1 (a non-linear elastic property). The resins could not be differentiated by means of intrinsic viscosity or GPC measurements. The Lodge StressmeterÒ is a new slit-die rheometer designed to measure N1 and the viscosity h of liquids in steady shear flow, in both on-line and sample modes, up to shear stress and shear rate values higher than those accessible with any available commercial rheometer. The Stressmeter pressure-difference-measuring system has been shown to resolve about 0.02 psi at ambient pressures up to 2000 psi (136 atmospheres) which are used in some polymerization reactors. 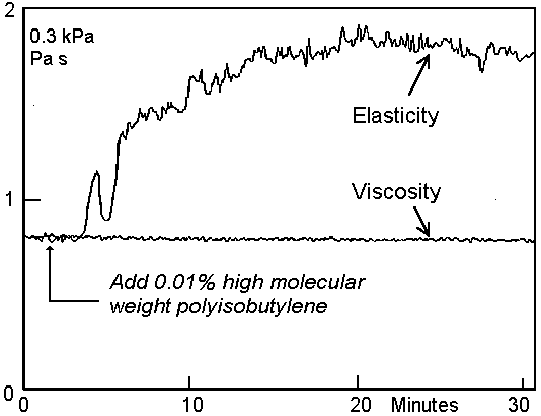 N1 is extremely sensitive to small changes in the high-molecular-weight end of polymer molecular weight distributions for concentrated polymer solutions (fig.1) and molten polymers. The Stressmeter has no moving parts (other than a gear pump); the pressure transducers, designed and constructed in house, are very stable. As a result, the Stressmeter is robust. By way of demonstration, the Stressmeter which was used to record the fig.1 data was once struck with a hammer during measurement; there was no noticeable effect on the data or subsequent performance. One version of the Stressmeter has been designed for making measurements on molten polymers and other high viscosity liquids. 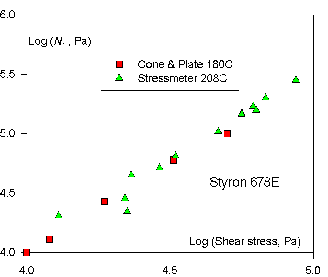 Fig.2 shows agreement between the values of N1, over a common range of values of shear stress, obtained for a sample of degassed molten polystyrene from a cone-and-plate rheometer and a Melt Stressmeter.